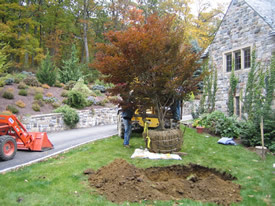 Our expert tree planting technicians have years of experience providing the Northeast with tree maintenance services. We have developed a reputation as the area’s trusted tree service company for residential and business owners. Don’t waste time and money on amateur tree companies who plant trees without consideration. Our tree experts have the expertise to choose which variety of trees to plant on your property and strategically plant them for optimal growth. We put a plan in place to ensure the various safety, environmental and other concerns associated with new trees are considered to encourage mature growth. Many of the problems that we see with younger trees are the result of improper selection and poor planting techniques. At Candlelight Landscaping and Nursery, Inc., we take great care in selecting healthy trees with good structure that will be well-suited to their sites. When planting we remove as much of the burlap, twine, and wire basket as possible. 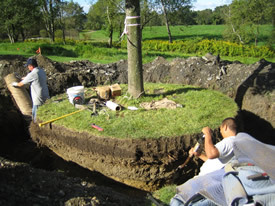 This allows us to inspect the trees’ root systems for decay, disease, injury, under-development, and girdling roots. Damaged and circling roots can then be pruned out prior to planting to ensure long-term health. The amount of sun and shade that a tree receives, as well as the exposure to or protection from wind can affect the growth and survival of a tree. In addition, an understanding of the growth rate, shape and size at maturity should be considered when planting in proximity to structures and traffic ways. From accessibility stand point, some locations are more challenging or sensitive and may require special care.